On this week's show, we speak with Janus Rasmussen of Kiasmos. The electronic duo has been touring the world for much of 2015 and we were able to catch up with him during a stopover in Portland, Oregon. As always, you can listen on iTunes, on our media player at the top of the page, or you can download the show directly here. Also, if you're interested in traveling with us to the Faroe Islands next summer, check out the Nordic Obsession Tour webpage. For many years, the host of this podcast has driven past this rather nondescript building and wondered, "What's going on in there." This week, we find out. On the show, we spend time with some Faroese hams, and an American who started a company that offers remote services to ham radio operators. And for those of you who say there's not enough Morse code on these podcasts, your prayers are answered. As always, you can listen on iTunes, on our media player, and on Stitcher Smart Radio. You can also download the show directly here. Note: Early registration has begun for next year's Nordic Obsession Tour. If you register before the end of the year, you can save $250 off your deposit. To learn more, go to the Nordic Obsession website. This week, we report on the events of July 23rd, Two whale hunts in the Faroe Islands happened that day and made international headlines. We'll take you to the village of Bour as one of the hunts happen. It's an episode that is likely to produce strong emotions, no matter what side of the argument you're on. As always you can listen on iTunes, on Stitcher Smart Radio, or on the media player at the top of the page. Or you can download the show directly here. To learn more about Faroese whaling (facts and figures rather than opinion stuff) we suggest consulting the site on whaling maintained by the Faroese government and the Wikipedia page on the subject. This week, we head to the island of Mykines. Many Faroese consider this the most beautiful island in the country, and it's hard to argue against that. This western-most island contains a hike that combines, jaw-dropping beauty with thousands of puffins and a historic lighthouse. In the first half of our journey, we survey the village that is home to just 13 people year round, and hike on the foggy highlands. You can listen on iTunes, on the media player at the top of the page, or on Stitcher Smart Radio. You can also directly download the show here. Also, there's less than two weeks left in our Kickstarter campaign. We're trying to raise $2,500 to fund another trip to the Faroes so we can record more episodes of our award-winning show. If you're able, please head on over to our Kickstarter page and show this podcast some love. On this week's show, we launch our third Kickstarter campaign and talk a little about immigration. Then we'll visit the village of Hov. For this year's Kickstarter campaign, we're raising money to return to the Faroes and visit the five islands the show hasn't been to yet: Koltur, Hestur, Svinoy, Litla Limun, and Stora Dimun. These are among the smallest islands in the Faroes, and one isn't even inhabited. But that won't stop us from bringing you shows from all 18 of the Faroe Islands. To donate to this year's campaign, you can visit our Kickstarter page. You can listen to the show on iTunes, Stitcher Smart Radio, or the media player at the top of this page. You can also download the show directly here. On this week's show, we wrap up our coverage of the 2015 solar eclipse in the Faroe Islands. We'll catch up with Kate Russo. She's an eclipse chaser who spent the past month in the Faroe Islands helping the tourism board and others prepare for the eclipse. Now Kate's home in Northern Ireland, but her thoughts still turn to the Faroe Islands. We'll talk to her about eclipse day, and what things have been like since. Then we'll visit a village that gets a lot of traffic (by Faroese standards, anyway) but not much tourist love. Also, we'll check out the Podcast Awards and see who won this year's competition. As always, you can listen on iTunes, on the media player at the top of the page, or on Stitcher Smart Radio. You can also download the show directly here. This week, we talk to filmmaker Mike Day about the documentary he's been shooting in the Faroe Islands for the past 4 years. The film is about the traditions and controversy surrounding Faroese whaling. Unlike much work on the subject, "The Island and the Whale" avoids sensationalism and instead portrays a nuanced picture of a complicated subject. We'll talk to Mike about what it was like to shoot this film, and the challenges he faced along the way. The film is currently in post-production and Mike has a Kickstarter campaign to help raise money to complete the film. You can support his efforts by visiting his Kickstarter page and donating before April 17th. As always, you can listen to the show on our media player at the top of the page, on iTunes, or on Stitcher Smart Radio. You may also download the show directly here. 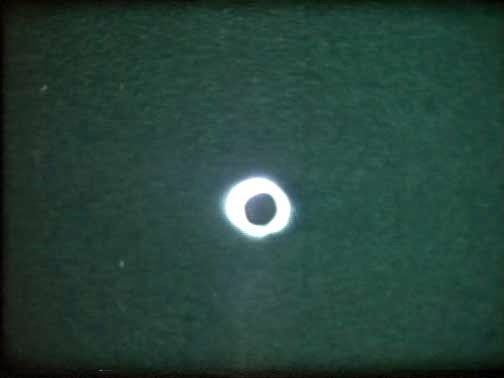 Also, there's an English language webcast covering the eclipse as well. You can see it here. This week, we talk to one of the organizers of the Faroese Music Awards. The second annual event honored more than a dozen Faroese artists, and showcased 15 Faroese bands during the three-hour show. Rolant Waag Dam tells us how the show came to be, who the big winners were, and what's next for the fledgling awards show. Then we'll head to the southern tip of Eysturoy and sit on a bench (pictured, above) that may or may not also be some sort of musical instrument. As always, you can listen on iTunes, on our media player at the top of the page, or on Stitcher Smart Radio. You can also download the show directly here. And, of course, the eclipse is almost upon us. If you're not lucky to be in the Faroe Islands for it, you can watch it online in many places. The BBC will have a webcam covering the eclipse. The Faroese national broadcaster will also have full coverage that will stream online. Check back later for the link to that broadcast. This week, we head to the Faroese ghetto in Copenhagen. While the student housing complex the Danish capitol doesn't really fit how we use the term "ghetto" today, it is home to a large number of Faroese students, making it one of the largest groups of Faroese people outside of Torshavn. Our charming tour guide, Suni Joensen (pictured, above) will take us through a series of rather charmless buildings (also pictured above) where he and other Faroese students live. You can listen to the show on iTunes, on our media player at the top of the page, or on Stitcher Smart Radio. You can also download the show directly here. Also, we've been nominated for a Podcast Award. Winners are determined by popular vote, so please go to the Podcast Awards website and vote for us in the "Travel" category. You can vote for us once a day for the duration of the voting period, so vote early and often for the Faroe Islands Podcast. This week, we head out into the outfields of Skuvoy and look for skua chicks. Spoiler alert: we find some, and their parents are none too happy about it. We'll also learn more about the birds and why studying them can give clues about pollution in the environment. As always, you can listen on the media player at the top of the page, on iTunes, or Stitcher Smart Radio. You can also download the show directly here. This week, we travel to the islands of Skuvoy. It's not the easiest island to get to, so it's often neglected by tourists. But we're getting a special look at the place from a field biologist who studies birds on Skuvoy. We'll take a choppy boat ride (see video above) before heading into the village and preparing for adventures in the outfield. As always, you can listen on iTunes, on the media player at the top of the page, or on Stitcher Smart Radio. 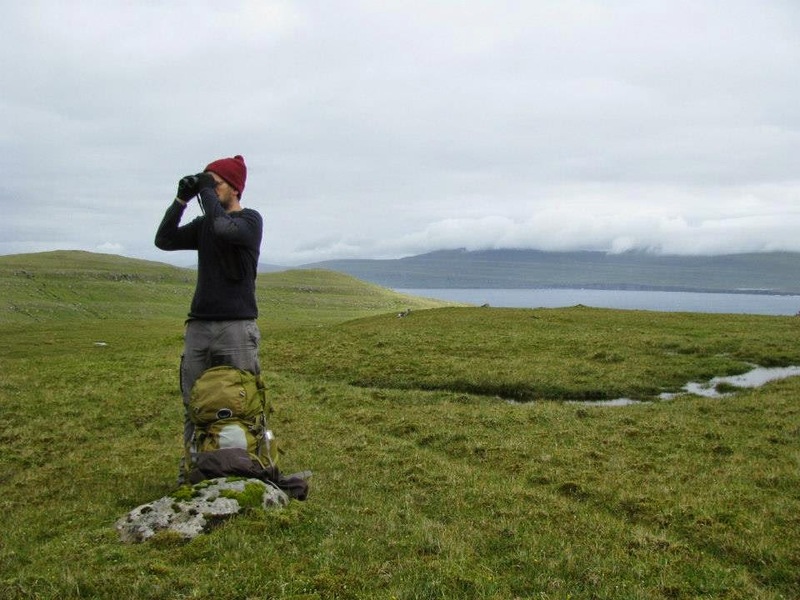 Reminder: There's still room on this July's Nordic Obsession Tour to the Faroe Islands. To learn more, head on over to the tour's website. Also: We're throwing our hat into the ring for this year's Podcast Awards. Please go to the Podcast Awards website and nominate the Faroe Islands Podcast under the "Travel" category. This week, we look back at Faroe Pride, 2014. 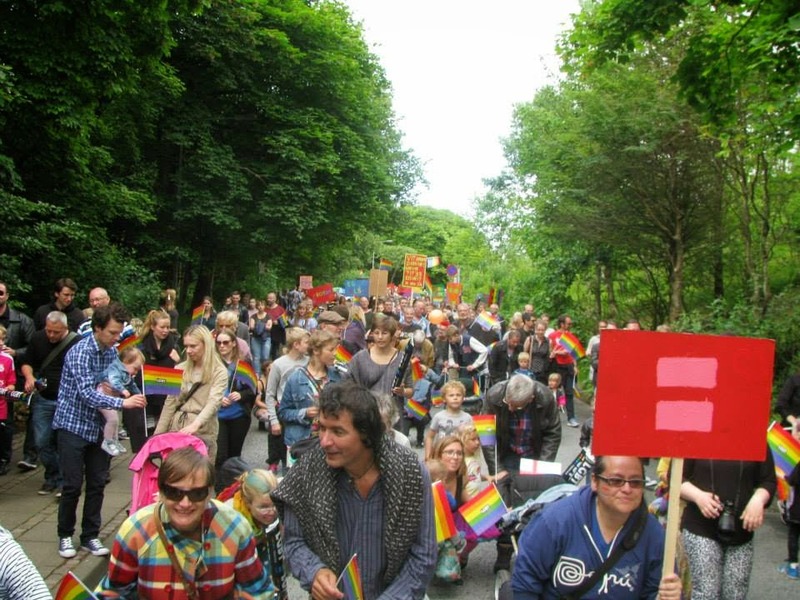 It was just two years earlier that more than 10% of the Faroese population took to the streets of Torshavn in support of LGBT rights. It was a historic event that changed the way people viewed LGBT issues in the Faroe Islands. Two years on, the crowds are somewhat bigger, but has the event become... routine? And if it has, is that really a bad thing? We'll hear sound recorded at last summer's march and talk to LGBT Foryar leader Eiler Fagraklett about what it's all supposed to mean. As always, you can listen on our media player at the top of the page, on iTunes, on Stitcher Smart Radio, and really anywhere quality podcasts can be found. On this episode, we talk about a series of photos taken at the march, you can see those pictures here. On this week's show, we visit the Faroe House in Copenhagen. The house is set up to meet the needs of the thousands of Faroese people who live in Denmark's capital. The house has a bar, a performance space, and room for schools, social workers, health providers, clubs, and even a baptist church. We'll talk to the director of the Faroe House, and afterwards, we'll travel over to Torshavn and listen to the sound of a mechanical billboard in an attempt to gauge the Faroese economy.